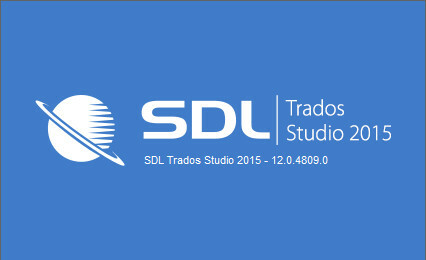 SDL Trados Studio 2015 has just been released. As a beta tester, I’ve been trying out the new version for a couple of months, reporting bugs, discussing improvements with the developers and other beta testers, and enjoying seeing new features in action in real-life projects. Here’s my account of the new features in Studio 2015. Even if you’ve never used Studio before, you’ll be familiar with the concept because it comes from Microsoft Word. AutoCorrect will correct your typos, so teh will be quickly replaced by the. TWo INitial capitals will turn into Two Initial capitals. a forgotten uppercase at the start of a segment will be automatically capitalised, and if you leave the cAPS lOCK key on by mistake, Studio will correct it for you. You can also add words that you often type incorrectly. The first I added was “adminsitration”; it’s a word I’ve written wrongly on and off for about 20 years. How nice to have Studio correct it for me at last. Don’t forget that you can also use the “replace” box as a shortcut for commonly-used strings or terms. I’ve added “EMA”, which Studio now replaces with “European Medicines Agency”. 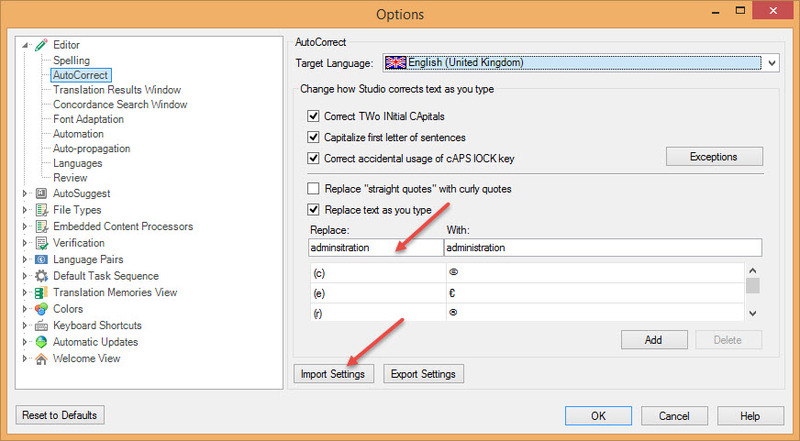 AutoCorrect settings can be imported and exported as a Studio .AutoCorrect file. Unfortunately you can’t import your AutoCorrect lists from Word into Studio or vice versa, because Word stores these lists separately from the other AutoCorrect settings, as .acl files. Dragon Naturally Speaking users will be pleased they no longer have to say “Cap” to capitalise the first letter of every segment. Studio now autocorrects it as you speak! A big thank you to SDL for finally listening to its users. (We’ve been asking for this feature since 2009.) Not only is it better late than never, AutoCorrect is actually my favourite new feature in Studio 2015. In my opinion, it’s worth buying or upgrading to this version just for AutoCorrect. Studio has handled editable PDF files since 2011. Now, it can also process scanned PDFs through the Solid Documents engine, which carries out optical character recognition (OCR) and extracts texts from images in the background, before the file is opened as an .sdlxliff in the Editor. A good conversion requires a good quality scanned image, so don’t expect miracles on skewed, blurry scans or text with background noise (photocopy lines, smudges, stamps on top of text, etc.). The OCR engine works for these languages: English, Danish, Dutch, Finnish, French, German, Italian, Norwegian, Polish, Portuguese, Russian, Spanish, Swedish and Turkish. Also, make sure you adjust some important settings before you process a scanned PDF, to get the best possible results. For the Layout option, I recommend Flowing. This is the most basic output you can get with formatting, including correctly formatted bullet points, etc., and it provides a starting point for pre-editing the file in Word (see below). The options at the bottom of the pane define how Studio will recognise text. Every character. You have to use this for combined PDFs (containing both editable and scanned text). Problem character is for scanned PDFs (although you can also use Every character). If the output looks OK, then you can translate it as is in Studio. If you need to adjust the formatting and word recognition errors, it’s probably more efficient to carry out these corrections in Word, and then open this file in Studio for translation. The additional capability to process scanned PDFs is very useful for translators who are just starting out and haven’t built up their full set of tools yet. More experienced translators will probably already be using Abbyy FineReader or other OCR programs that have far more advanced editing and dictionary features. AutoSuggest (AS) has been around for a long time in Studio. It offers suggestions from a drop-down list as you type, based on translation memories (TMs) that have been processed and converted into AS dictionaries. It also gives you suggestions from termbases, autotext lists and Open Exchange plug-ins. Why is it useful? It saves you typing long phrases, helps jog your memory and ensures consistency. Just to clarify, you only need a special AutoSuggest license to create an AS dictionary. All other resources, new and old, pop up even if you don’t have an AS license. With the introduction of AutoSuggest 2.0, I’ve had to increase the value in Show the suggestions window to 5. I recommend you fine tune this value until it works well for you. Now, go to File>Options>Editor>AutoSuggest>Translation Memory and Automated Translation and decide which match types to include in AutoSuggest look-up. Automated translation only kicks in if there are no other results. Concordance matches only returns suggestions from automatic concordance look-up, not from a manual search using F3. If you enable this option, Studio will automatically turn on Options>Editor>Concordance Search Window>Perform search if the TM lookup returns no results. Minimum suggestion length is set to 1 word by default. I changed this to 2 to make suggestions more productive for me. Minimum number of characters typed before displaying suggestions is set to 3 by default. I changed this to 2 because I seem to get almost the same results after typing 2 characters. Again, it’s definitely worth experimenting with these values. Note that the new look-up resources only work the first time you enter a segment. If you leave the segment and return, the suggestions don’t appear again! Do you still need an AS dictionary? Now that we have new AutoSuggest resources, you may wonder whether it’s still worth building AutoSuggest dictionaries, especially as you need a TM with 10,000 units and a separate license to do so. I think it’s still worth it. AutoSuggest dictionaries make highly accurate, relevant suggestions as you type. The new resources are a brilliant complement to these dictionaries. It’s quite common to receive an Excel file that has the source text in one column and instructions to translate the content in the next column. 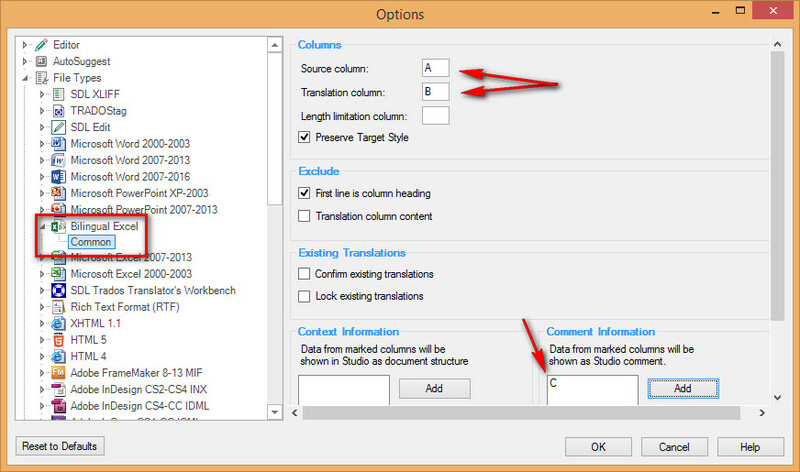 Before the bilingual Excel file type was introduced in Studio 2015, you had to copy the source text, paste it in the neighbouring column and then hide the first column. Now, you can specify which column is which. To do this, select the bilingual Excel file type in File>Options>File Types. If you can’t see it in the list on the right, click on Additional installed File Types exist. Move the Bilingual Excel file type above the other Excel file types in the list, to make sure Studio finds it first. You may prefer to do this just for a specific project rather than in your general settings. Under Common (see screenshot below), specify your source and target columns. If you have any comments in the file, specify which column they’re in. Unfortunately, Studio will only add them at a paragraph level in the sdlxliff file, so they won’t be highlighted in the Editor and you’ll only be able to see them in the Comments’ pane. Formatting is preserved at cell level if you disable Preserve Target Style, but formatting of individual words will be ignored. So if you have an Excel file with a lot of bold, italics, etc., I suggest you use the old file type instead, with the workaround mentioned above. Find your bookmark settings on the Home tab when you’re in the Projects or Files view, or on the Advanced tab when you’re in the Editor. 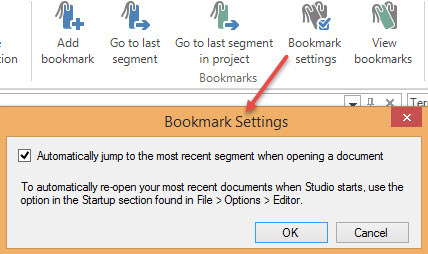 Bookmarks are automatically added to the last segment you access in a document and in a project, and you can add your own bookmarks with comments. I find this useful when I translate a long document and check sections of my work before going on. I then add a bookmark and a comment with the word count at that point. You can also set Studio to re-open your document at the last accessed segment. AnyTM will let you use TMs with different languages, different language variants and reversed language direction in the same project. 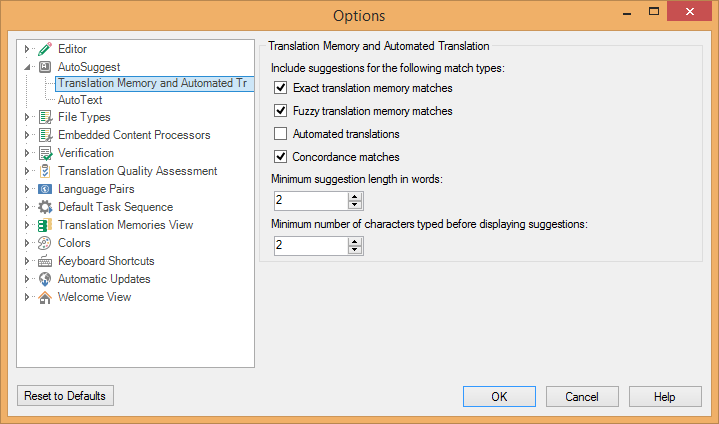 To add these TMs to general options, go to File>Options>Language Pairs>Translation Memory and Automated Translation. In the right-hand pane, click Add and select AnyTM. With the AnyTM mixed-source language translation button enabled (see screenshot in the Symbols section above), Studio will also detect the language of each source segment and look up translations in the corresponding TM language. Symbols, Bookmarks and AnyTM have been available on the Open Exchange as plug-ins for several years now. So why are they built into Studio now? First, they’re among the most popular apps because they receive the most downloads. So now, whenever a new Studio version comes out or you change to a new work machine, you don’t have to spend time downloading and installing these apps one by one. Second, a surprisingly large number of Studio users have never visited the Open Exchange or installed any apps. By bringing the most popular apps into the core product, all users, especially beginners, will be sure to have access to these useful features. So, although these features aren’t new in Studio 2015, they’re good news for everyone: installation is faster for power users and productivity is improved for new users. I’m always surprised that translators’ tools aren’t available in scores of languages. After all, developers have access to excellent localisation software and top-notch translators. With Studio 2015, SDL has added two more interface languages, Italian and Russian, and apparently Korean is in the pipeline. To change your interface language, go to the View tab from any window and select User Interface Language. I hope this post helps newish users decide whether they want to upgrade to Studio 2015 and encourage complete beginners to take the plunge. Stay posted for a follow-up article on new features for advanced users. Coming soon to a blog near you! This entry was posted in 1. The Basics, SDL Trados Studio and tagged AutoCorrect, AutoSuggest, bookmarks, OCR, SDL, Studio, Studio 2015, Trados, Translation memory, update, upgrade. Bookmark the permalink. AnyTM is a very helpful add-on, I believe. Sometimes translators do receive multi-language documents. Pingback: (CAT) – SDL Trados Studio 2015: New features for beginners | Emma Goldsmith | Glossarissimo! Hi Emma, thanks so much for your very informative blog. I’ll wait for the next one to decide whether to get Studio 2015 or not. I’m now on Studio 2014. Hi Emma. I will definitely upgrade for the first letter capitalisation issue. As for typos with administration, we are fellow sufferers. A brain-finger motor touch typist problem I think. Hi Emma. I recently tried to convert a scanned PDF – a letter received from a regulatory authority which I had to translate, let’s say, for a sponsor of a clinical trial – and experienced a complete disaster. The only solution was to rewrite the whole content by hand. Unfortunately, I have to say that the SDL Trados marketing team is “running in front of a cart”. At least, for non-English languages. Ok – that is better than nothing but I expected a more reliable result. Otherwise, everything seems working fine in general and it is worth to upgrade to the new Studio 2015. Thanks for sharing your experience with a scanned PDF, Jānis. I agree that it depends on the source language itself. I’ve just edited my post to add the languages that are recognised by the OCR engine. Maybe your language isn’t included in that list? For Spanish source PDFs I’ve carried out several tests and have seen excellent results when the scan is excellent quality. I’ve also seen appalling results when the scan is appalling quality. Stands to reason. The big advantage of a standalone OCR tool (such as Abbyy) is that you can decide how to process it (which cells to merge in a table, which areas to delete where you can see lines/smudges, etc.). Also, training your tool by adding common words and symbols to a language-specific dictionary makes it even more efficient. Yes, my language is not included in that list. Hmm, the SDL Trados team did not mention that this feature is only available for a limited set of languages and actually is the subject for use “as is”. Ok, I will test other available OCR tools. Thank you for sharing this information. According to the Abbyy FineReader website, it offers dictionary support for 48 languages. Excellent blog post, Emma thank you. I’m considering an upgrade (I bought a 2014 licence so I was a bit bothered to see a new version so soon) and this has been very useful in answering my “is it worth it” questions. Glad the post was useful, Tracy. Yes, I think Studio 2015 is worth it. In fact, as professional translators, I think we should work with the most up-to-date versions of all the programs we use in our daily work. That way we’ll get the most out of our machines. Good coverage, Emma. Thanks a lot! 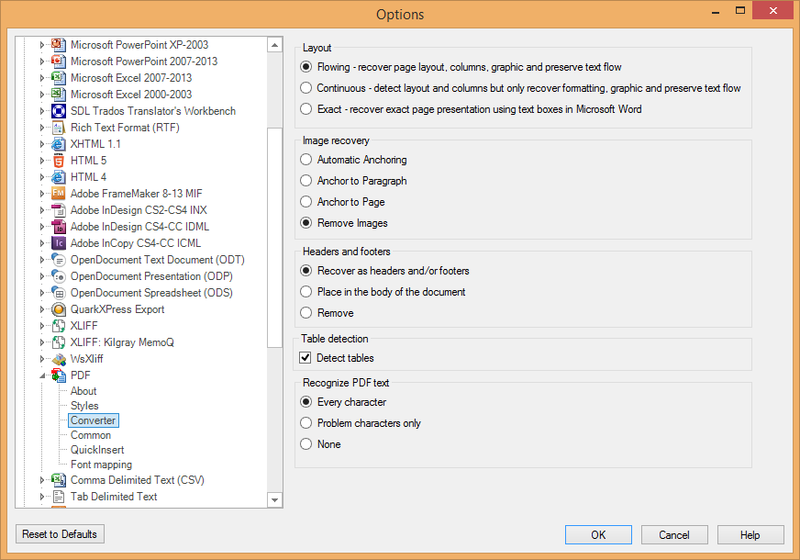 Does it support new MS Word 2013 in preview mode? Studio 2014 did not. Hi Andrey, the answer’s in my 2nd post on Studio 2015!